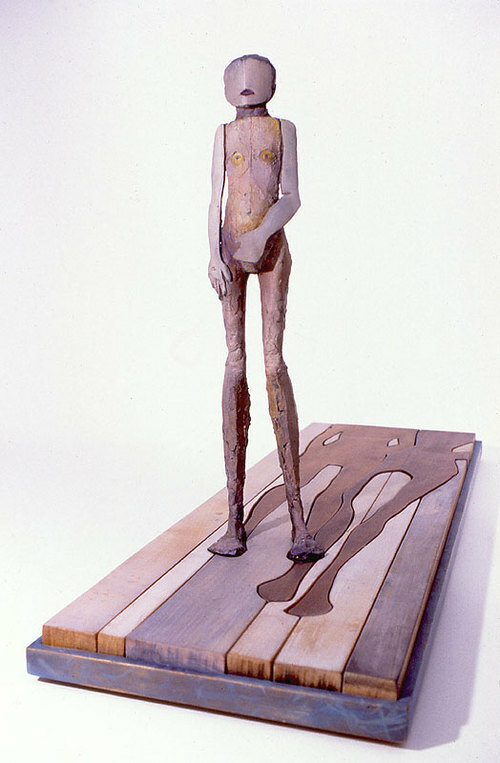 Painted bronze and wood, last revision 1991, 27"x 9" x 16". This figure was originally part of a family, in a piece called Procession. But the figures clashed. First, I eliminated the father, later the mother. The piece perplexed me. I called it Puzzle Boy. As early as 1979, I suspected it might be Raymond, my husband's son. He lived with his mother on the East Coast. His father had not seen him in five years. He was unknown. He was a lost piece in the puzzle of our family. In 1984, Ray came to live with us as a teenager full of the unfinished business of his parents' long ago divorce, and my suspicion was confirmed. Yet years later, when both our sons were raised, I realize it could just as easily have been about his brother, Darin, about sons and their mothers.